This post originally ran on StartupJuncture. Check out the lively discussion there, too. How foolish are the friends, family and fools? 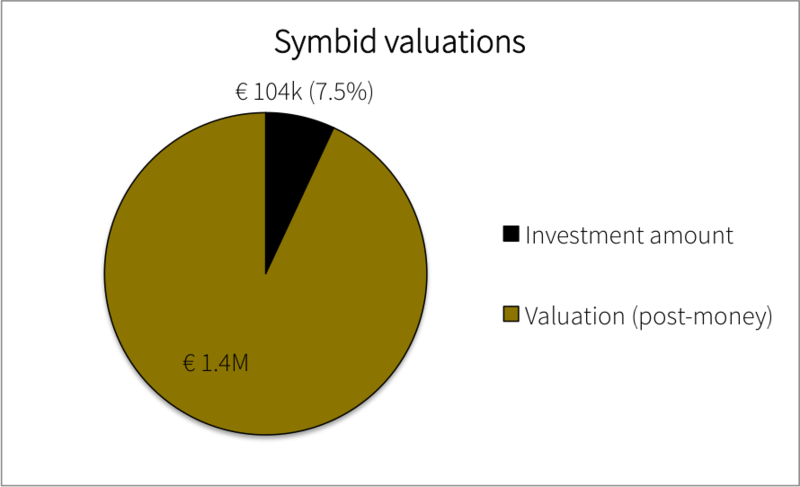 In the first post on crowdfunding valuations, I found that the average project on the Dutch crowdfunding platform Symbid raises €104k for a total company value of €1.4M, which represents an average equity stake of 7.5%. Moreover I described that it seems that the valuation is not a critical success criterion for raising crowdfunding money, concluding that maybe crowd investors don’t look at the valuation or don’t bother about it. The personal connection to a project might be a better reason to invest than investing to actually make money. So, the average post-money valuation of all projects on Symbid is €1.4M (pre-money: €1.3M). How does this number compare to other valuations? Angellist, a website where ‘angels investors’ and startups can meet, says that in the Netherlands the average pre-money valuation is $2.9M (~€2.3M). This valuation is based on done deals but includes companies that raised second, third or even fourth rounds. In that sense, the sample of Angellist is not really comparable to the one of Symbid, as most projects on Symbid raise their first round. Within the Symbid sample, I made a distinction between pre-revenue companies (N = 39) and companies that generate revenues already (N = 19). This ‘monetization status’ was not always explicitly provided by the company, so I made a rough estimate based on the description of the project and, if available, financial statements. The result is presented in the figure below. As expected, the companies that generate revenue have a higher valuation than pre-revenue companies (€2.0M and €1.3M respectively). Interestingly, the investment amount is approximately the same for pre-revenue and revenue companies (around €100k). Nota bene: the average valuation of pre-revenue companies that raise money via Symbid is €1.3M. €1.3 million! These companies barely made any money yet and still think they’re worth more than a million euros. Wow, that sounds almost like a bubble, doesn’t it? Crowdfunding Valuations in the Netherlands: Are We Crazy? This post originally ran on StartupJuncture, with a lot of discussion. Friends, family and fools. That’s how we refer to the group of investors that is willing to put money in your startup business when the risks are high. How foolish are they? I analyzed the equity crowdfunding deals in the Netherlands to see if the valuations people are willing to pay are rationally explainable or emotionally nuts. My hypothesis was that crowd investors are less sophisticated (i.e. less rational, calculated and in for the profit) and more willing to pay a premium price if they like the product or the vision of the entrepreneur, than professional investors. In other words, valuations of crowdfunding projects are expected to be higher compared to valuations of startups that are engaged with professional equity investors (such as business angels and venture capitalists). To find out what the crowdfunding valuation are, I looked at publicly accessible data from Symbid, an equity crowdfunding platform in the Netherlands. (CrowdAboutNow, another platform that provides crowdfunding for equity, is not really transparent about the (implied) valuations of the projects so I didn’t include them in my research sample). I collected Symbid data manually, by browsing their website and searching their newsletter emails with upcoming crowdfunding campaigns. I excluded pledge and one-off projects such as the movie ‘Wiplala‘ from our sample. This resulted a total research sample of 70 projects. The post-money valuation is already provided by Symbid but the calculations are simple: post-money valuation = investment amount/ % of equity. The average investment amount and valuation of all Symbid projects are presented in the figure below. Concluding: the average project on Symbid (excluding one-off projects) raises €104k for a total company value of €1.4M, which represents an average equity stake of 7.5%. This post originally ran on Thomas Mensink’s blog. 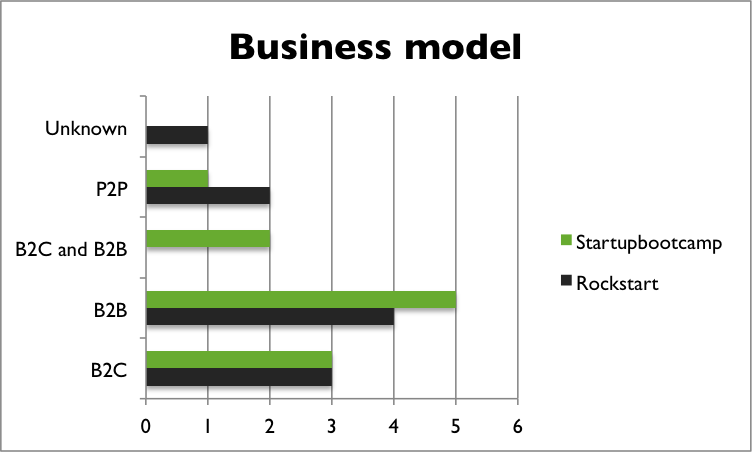 Rockstart has more early stage startups, which have more of a B2C orientation. Compared to SBC, more Rockstart startups want to address or create new markets. The challenge for these startups lies in marketing and creativity, competences Rockstart is good at. Zazzy is the only startup that is in the new technology and new market quadrant, which could offer both risks and, at the same time, large upside potential. The startups of SBC more often already have a product which generates revenue, and more frequently aim for B2B (sometimes in combination with B2C), which matches well with the corporate network of SBC. The startups make more use of existing technology and have less of an aim for new markets. Therefore, it seems that the risk profile of the SBC startups is smaller than that of Rockstart. A short description of every startup if given here: Startupbootcamp, Rockstart. Rockstart en Startupbootcamp hebben afgelopen week hun nieuwe lichting startups gepresenteerd. De accelerators, die vorig jaar hun eerste lichting hadden, zijn eigenlijk zelf ook een soort startups waarbij hun positionering en profilering wellicht nog aan verandering onderhevig is. Wij analyseren beide lichtingen en kijken hoe de accelerators zich onderscheiden van elkaar.